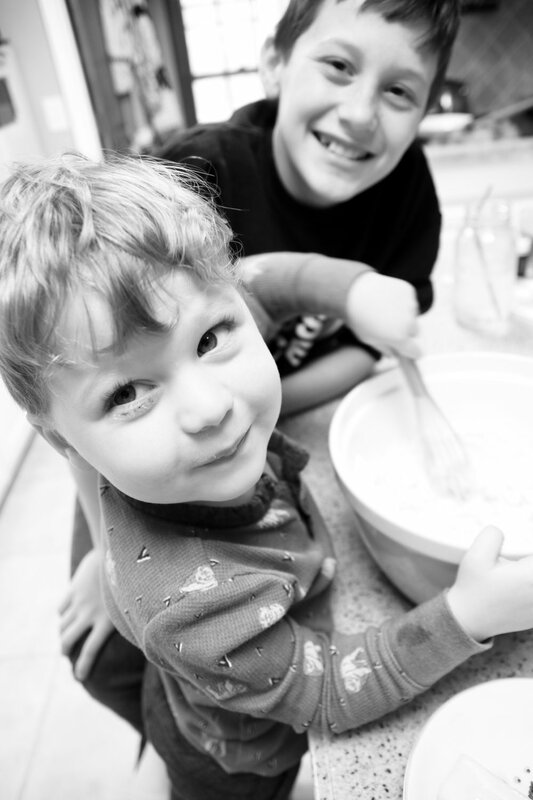 When I was little Christmas always included a day of baking cookies with my mom, sister and Grandmother, and we decided to keep the tradition with Elliot. 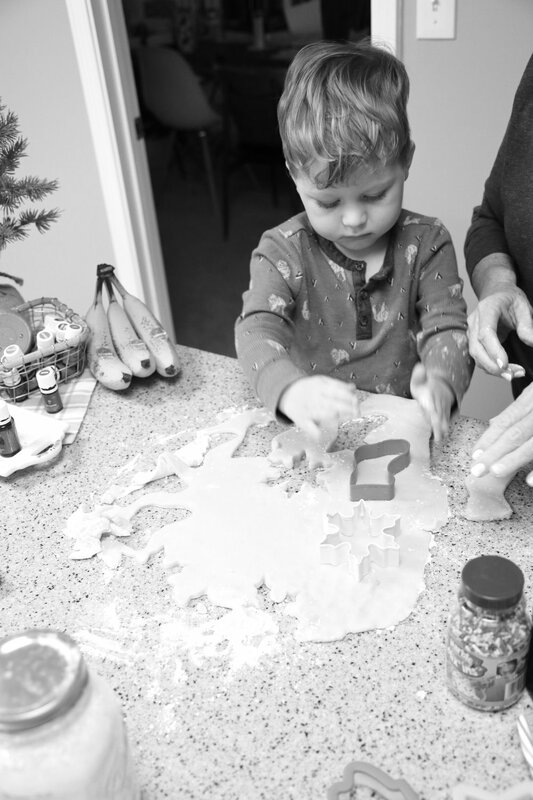 So yesterday my mom, my nephew, Elliot and I made Christmas cookies! With the Christmas music playing, cinnamon + spruce diffusing and cookies baking, we had the best day! Even our dog Sam got in on the action, eating every tiny sprinkle or crumb that fell on the floor. He was so much in the middle of it all that he got powdered sugar all over his face! We used a traditional batter and a gluten free one* and decorated with buttercream frosting (recipe below!) plus whatever we had on hand - mini chocolate chips, crushed candy canes, sprinkles, raw sugar crystals. The end result of our cooking making was perfectly imperfect. It was hard for my inner perfectionist to relinquish control, but in the end I'd rather have messily made + decorated cookies with my people than to have picture-worthy ones on my own. It was the sweetest sight to see Elliot with his Mimi and his cousin, happy and excited and carrying on a tradition that I had with my sweet grandmother. For the first time since her passing I was able to think about her with only joy and no sadness. It felt like she was finally telling us it was ok to let go. No bitter, just sweet. Whip the butter + sugar in a stand mixer (we LOVE our KitchenAid), then add vanilla. Add the milk 1T at a time to desired consistency. Optional: mix in plant-based food coloring. Transfer to a plastic bag, cut the tip off and decorate! *We used this recipe for the cookies, and they were okay. It may be the brand of gluten-free flour we used (King Arthur) or maybe we just are more used to baking with almond flour, but the texture seemed a tiny bit gritty. When we do use gluten-free flour, we typically use the Bob's Red Mill 1:1 Gluten Free Baking Flour, which would probably yield better results! Last Minute Gifts That Spark Joy!